Mobile car video technology has come a long way since the days when it was mainly limited to recreational vehicles and limousines, and the sheer volume of different options can be staggering. However, it can be remarkably simple to retrofit a vehicle, and a lot of new vehicles even have OEM options. In order to retrofit a vehicle with mobile in-car video, there are three main requirements. Every in-car video system needs a video source, screen to play the video on, and something to play the audio. The simplest solutions combine all three of these components in a single device, but there are a lot of other viable configurations. Head units. Some head units can play DVDs or Blu-ray discs in addition to CDs. These head units sometimes have built-in screens, but they typically also include one or more video outputs. That can allow a single head unit to act as a video source for multiple screens throughout a vehicle. Combination units. Some video head units are combination devices that include both DVD or Blu-ray functionality and a screen. There are also roof-mounted and headrest-mounted combination units that don’t have to be plugged into a head unit. These devices can also include video inputs, which provides the widest possible range of entertainment options. Standalone video players. In addition to video head units and combination devices, it’s also possible to use a standalone DVD player as a video source. These typically aren’t installed permanently, and devices that weren’t designed for automotive use may not stand up to the vibration that occurs when a vehicle is in motion, but this can be a low-cost option. Head units. The easiest way to add a car video system is to install a video head unit that includes a screen. A lot of new vehicles include built-in touchscreens that can be used to operate the infotainment system, but there are also a number of aftermarket options. Most of these LCD head units are double DIN, but there are also single DIN options that include screens that slide out and lock into place. Roof-mounted screens. It can be difficult for some passengers to see an LCD that’s built into a head unit, but roof-mounted screens are typically viewable by everyone in the back seat or seats. These screens fold down from the ceiling, so they can be stowed away when people are entering or leaving the vehicle. Headrest LCDs. Where roof-mounted screens solve the problem of visibility, headrest LCDs allow different passengers to watch their own video content. These screens can typically be wired into a video head unit, but some of them also have built-in DVD or Blu-ray players. Removable units. 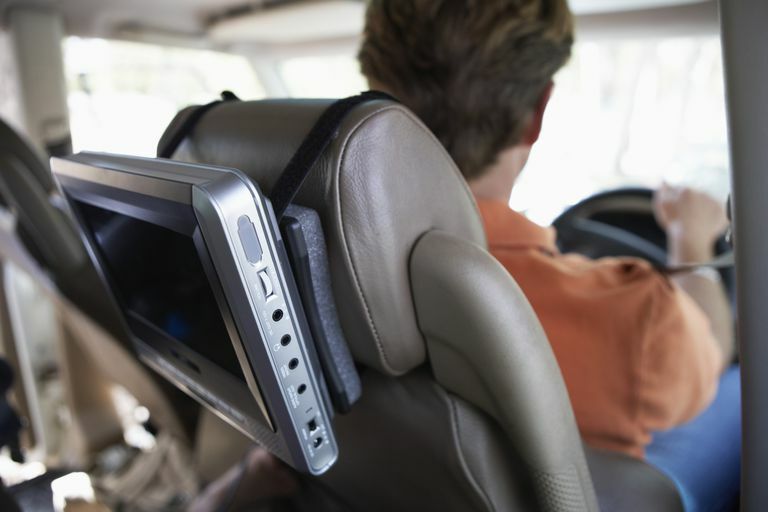 Both roof-mounted screens and headrest LCDs require some installation work, but removable units are just strapped onto a headrest. That allows these screens to be used in multiple cars or trucks, and they can even be temporarily installed in rental vehicles. Existing audio system. If a car video system makes use of a video head unit, then the audio will already be piped through the existing system. Other video sources can also be connected to the existing audio system, but the availability of that option depends on whether the head unit has auxiliary inputs. The other way to use an existing audio system is to transmit the sound with an FM broadcaster, which the existing head unit will be able to pick up with its radio tuner. Wireless headphones. If a car video system has more than one player, the best option is to obtain a few pairs of wireless headphones. These can also be useful if the driver doesn’t want to be distracted by the video system. Some headrest screens and flip-down LCDs also have output jacks that wired headphones can be plugged into. Built-in speakers. Roof-mounted units and headrest LCDs sometimes include built-in speakers, and removable combination units typically have speakers as well. Using the built-in speakers is a low-cost option, but it typically won’t work if more than one unit is being used. Even if both units are using the same a/v source, the sound may be slightly out of sync. Above and beyond the ability to watch movies on the road, there are also a number of other potential benefits that come from installing a car video system. You can use in-car video to watch live or time-shifted television, play video games, and even stream Internet video content if you have a connection.